With a multitude of events taking place all year round, Okinawa’s calendar is always full, offering fun for locals and tourists alike. Here are some ideas of what to see during your stay in Okinawa! The kanhizakura (Cerasus cerasoides) blossoms come into bloom starting in northern Okinawa in early January. During that month, some of the earliest cherry blossom festivals in the county take place in towns and villages throughout the island. An annual tradition to pray for the family’s health by preparing and eating muuchii -- an Okinawan steamed rice cake wrapped in getto (shell ginger) or a Chinese fan palm leaf. 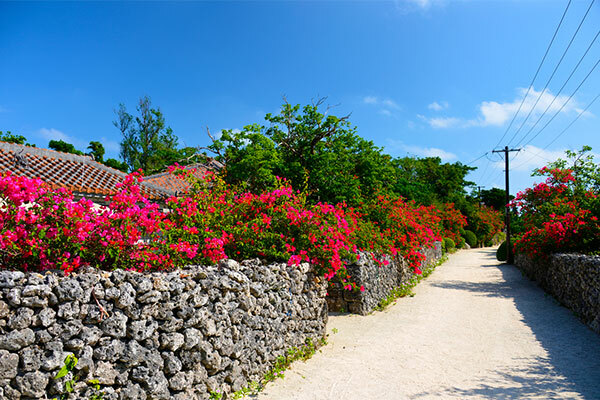 January through early May is the peak season for flower shows in Okinawa, when visitors can enjoy seeing beautiful flowers displayed at various places around the island, including Naha Airport, sightseeing facilities and resort hotels. 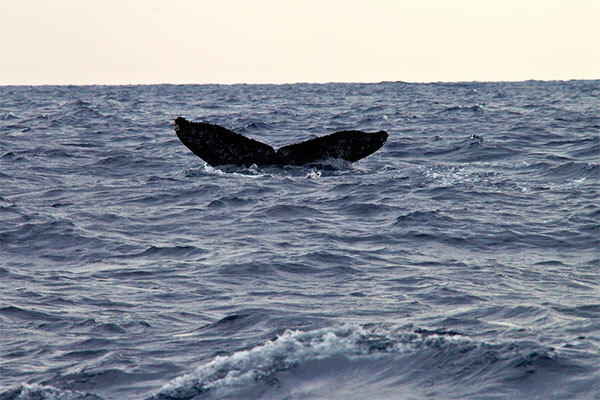 January to March is the season for watching humpback whales migrating through the warm waters of the Kerama Islands. Sunflowers are in season in Okinawa from late January until mid-February. The sunflower festival in Kitanakagusuku Village is one of the best ways to enjoy the breathtaking sight of countless sunflowers in their full glory. 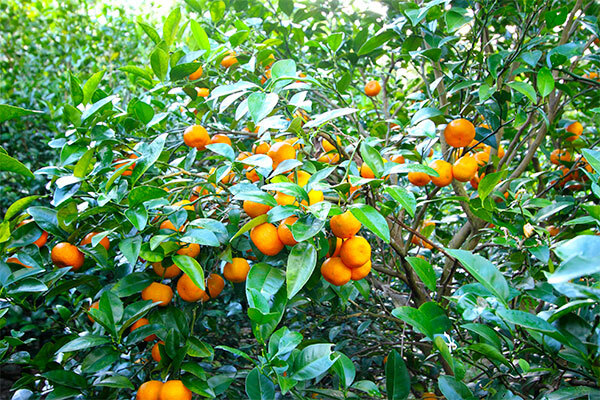 You can enjoy picking and eating tankan oranges at various farms in northern Okinawa during the months of January and February. Traditional Okinawan festivals and ceremonies are held according to dates in the lunar calendar, and the lunar New Year is one of the most important events of the year for Okinawans. Taking advantage of the relatively mild climate of Okinawa, many Japanese professional baseball teams come to Okinawa for pre-season training during February and March. 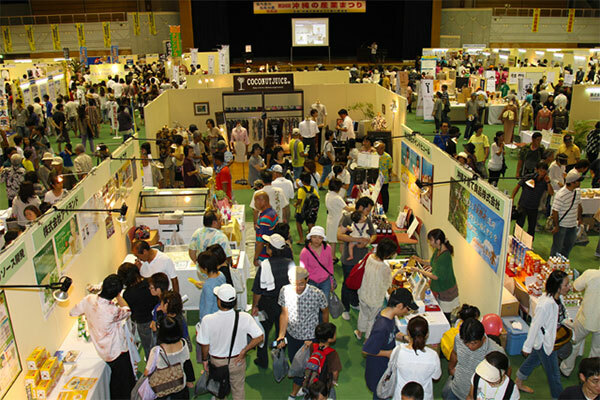 During the months of January and February, many Okinawan municipalities hold events featuring local specialties, including arts and crafts, processed food and vegetables, that are on display and also for sale. One of the most popular runs on the island, Okinawa Marathon features a scenic course stretching around the central part of Okinawa. The marathon offers participants the unique opportunity of running through a U.S. military base. Urizun, in the Okinawan dialect, describes the period between late February and late April. 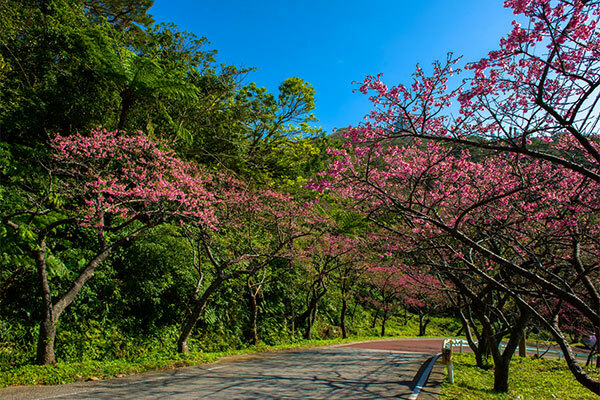 Urizun is the most comfortable time of year on the subtropical island of Okinawa, during which trees and flowers start to bloom. In conjunction with Sanshin Day, which takes place annually on March 4, a number of events featuring sanshin -- a three-stringed instrument that typifies Okinawan music -- are held in March across the island. An annual movie festival held over one week in Naha and Ginowan cities. A variety of related events are held around the island concurrently with the movie festival. The opening of beach facilities in the Yaeyama Islands takes place in late March, earlier than any other beaches in Japan. All Okinawan beaches are open for swimming by mid-April. Swimming season runs through the end of October at most of the beaches. An annual Okinawan ceremony in which monchu (an Okinawan word describing extended family including paternal relatives) gather in front of the family tomb and dine together with offerings of food and alcohol for their ancestors. During the annual lily festival on Ie Island, you can enjoy an amazing view of a field filled with some 1 million lilies in full bloom. 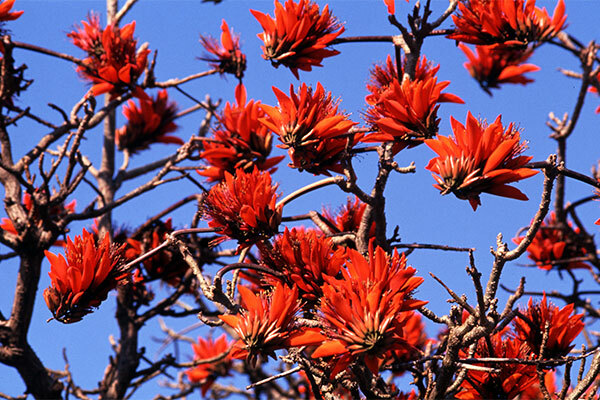 Deigo (erythrina variegata), the prefectural flower of Okinawa, blooms between April and June. 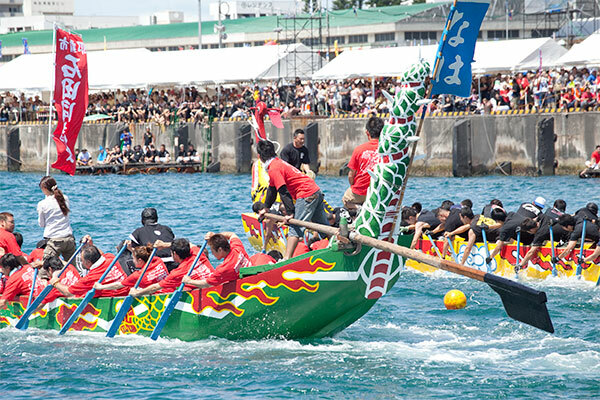 A variety of dragon boat races take place during the Naha Haarii festival. 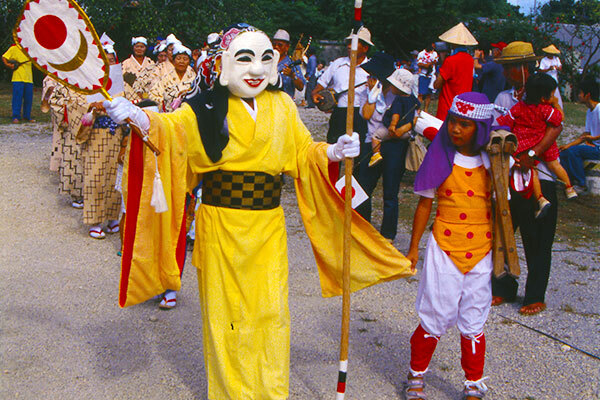 In addition, many more haarii events are held across Okinawa during the months of May and June. On May 5, Children's Day, koinobori (colorful carp banners) events are held in every town featuring myriad flying fish often put up along riverbanks and across rivers. Irei no Hi, June 23, is the day when the Battle of Okinawa came to an end in 1945. It's a public holiday only in Okinawa Prefecture, and victims of the war are commemorated by people throughout the island with a moment of silent prayer. Held in the fishing town of Itoman, this is a dragon boat event to thank the sea for its blessings and to pray for a safe voyage and a good catch. This is the biggest fireworks festival in Okinawa, where visitors can enjoy a wide variety of events, such as a sunset live music concert in addition to a stunning fireworks display. 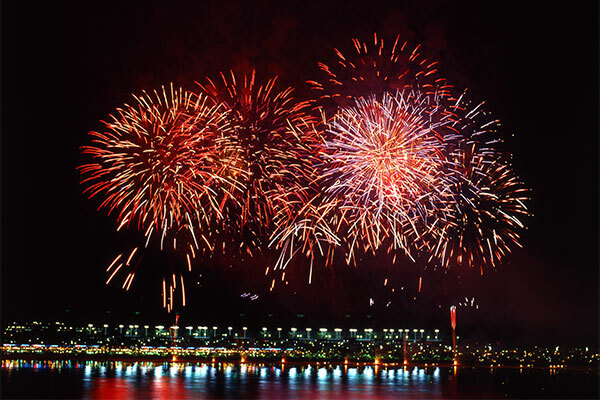 July and August are the peak summer months packed with a number of festivals accompanied by exciting fireworks shows. This is a festival for commemorating and paying tribute to one’s ancestors. Most businesses are closed during the Obon holidays since the majority of Okinawans celebrate the festival with their families. This is the biggest eisa festival in Okinawa where a number of groups from across the island come together and perform the traditional music and dance. 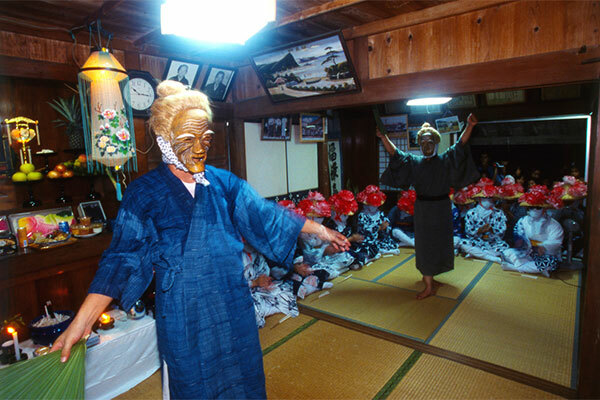 This is a traditional ritual held in various places across Ishigaki Island during the Obon festival. The performers, called angama, wear elderly male or female facemasks, representing ancestral spirits, and parade around houses in the villages while answering questions about the afterlife asked by residents. 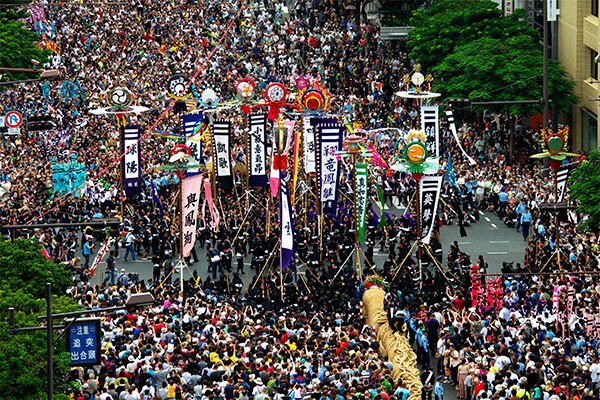 This is a big eisa parade held annually on Kokusai Street, Naha's main boulevard. The general public is also invited to participate in the parade. A traditional Obon festival to commemorate one’s ancestors and to pray for an abundant crop and good health. Shishi-mai (lion dance) is believed to cast out evil spirits and bring prosperity and a bountiful harvest to the community. 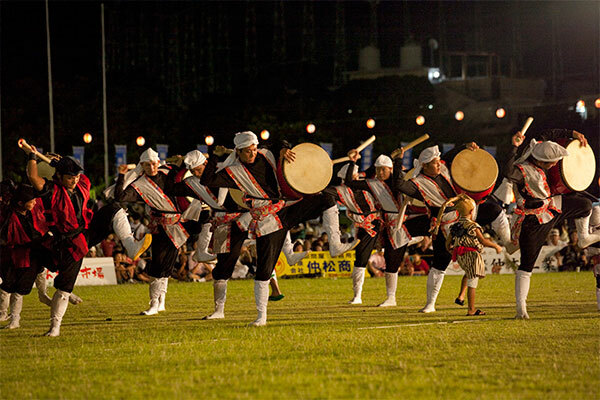 This event features shishi-mai dances performed by various teams from all over Okinawa. 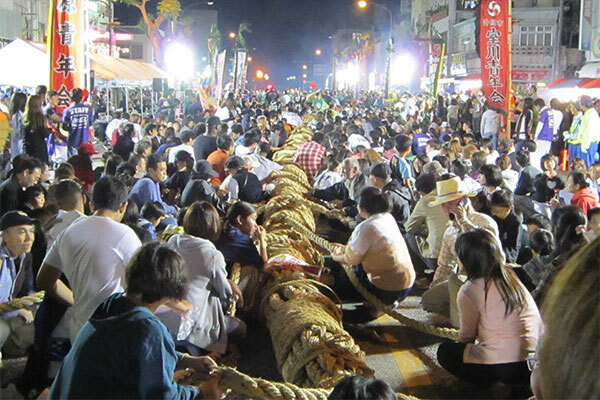 Among the three biggest tug-of-war events in Okinawa, the Itoman Great Tug-of-War is held to pray for a bountiful harvest and a good catch. During Okinawa’s biggest festival the main highway on the island, Route 58, is partially closed in the vicinity of Naha's downtown area to make way for the tug-of-war, the highlight of the event. 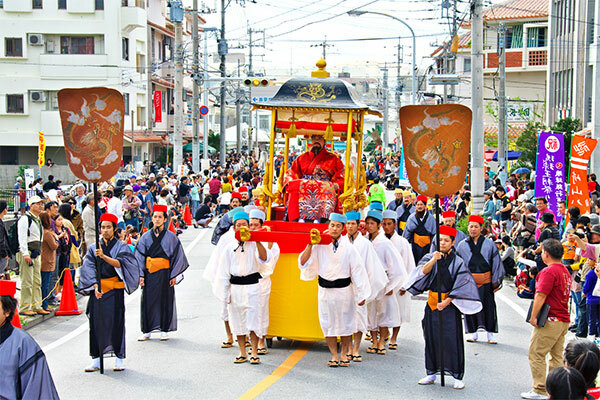 The main feature of the festival is the re-enactment of the Ryukyu Kingdom's royal procession, which takes place on Kokusai Street in Naha City. After sunset, Shurijo Castle is beautifully lit up with some 7,000 candles. Painting the whole body with mud and dressed in leaves, male villagers disguised as paantu gods walk around the community to bless people with mud. 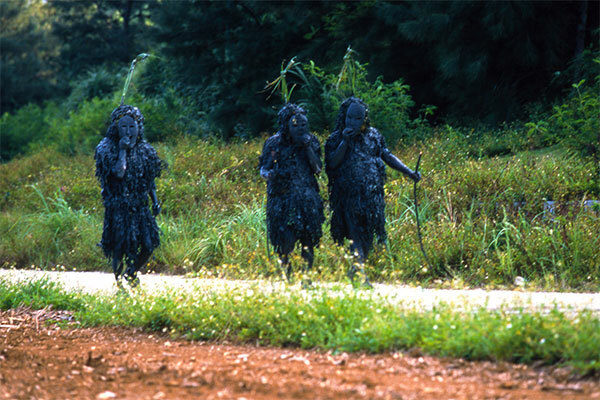 Paantu is a ritual for warding off evil spirits and praying for a year of good health. Held over the course of two full days, this is the biggest industrial exhibit in Okinawa, displaying any and every thing Okinawan. Held in Okinawa City, the event features a program full of exciting events, including tugs-of-war, a motorbike parade and more. This is the largest festival on Taketomi Island, held to pray for a good harvest with a ritual of sowing rice seeds. The festival features a program with over 70 traditional dance and music shows. 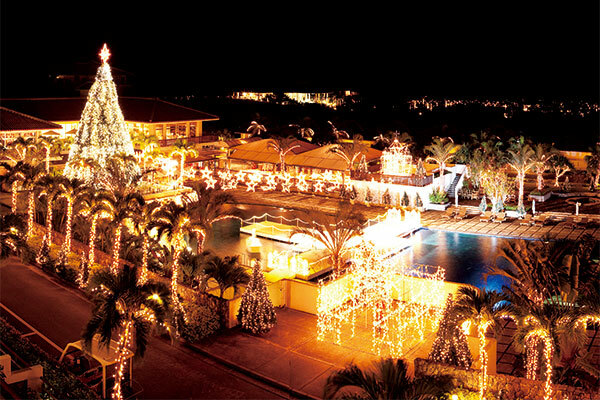 During the winter months, starting in November and running until February or March at some places, resort hotels and tourist facilities around Okinawa are illuminated with myriad sparkling lights in the evening. The festival features dance and kyogen performances to give thanks for the granting of wishes during the previous year. Ketsugan-sai was designated an Important Intangible Cultural Property by the Japanese government in 1994. 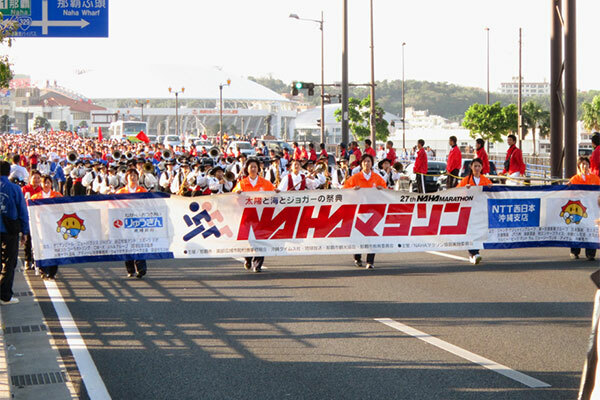 The largest marathon in Okinawa, the Naha Marathon has a course that runs through traditional townscapes in and around Naha City. 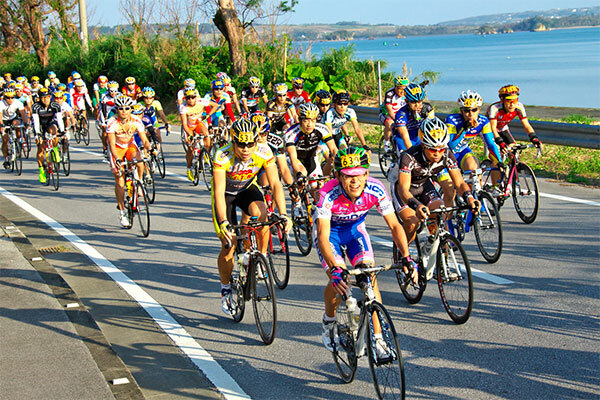 A number of sporting events are held in Okinawa from autumn to winter. There are many uniquely themed marathons and bike races, which all are worth checking out.